During his 20 years as a Partner at KPMG, Richard was a Managing Director and UK Board member for the firm’s Management Consulting and then Corporate Finance businesses. He was also Chairman of the Centre for Manufacturing Consultancy and non-executive Chairman of KPMG’s UK Automotive Practice for 7 years. He has been Chairman or Board member for a number of private companies and is currently Chairman and Controlling shareholder of a senior level recruitment business and an associated business research organisation. 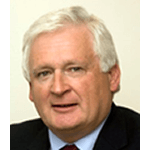 Richard served two terms as Regional Chairman of the Institute of Directors in the West Midlands and was on the IOD National Council for 14 years.